The Terrapin Peak Lodge was built in 2007 and features knotty pine wood ceiling and trim, rich colors and plenty of windows for viewing wildlife across nine acres of groomed mountaintop beauty. If you are looking for contemporary, rustic, secluded, charming and clean Lake Tenkiller lodging accommodations near the lake, then this is the place. Terrapin Peak is the perfect site for Oklahoma retreats and group lodging. 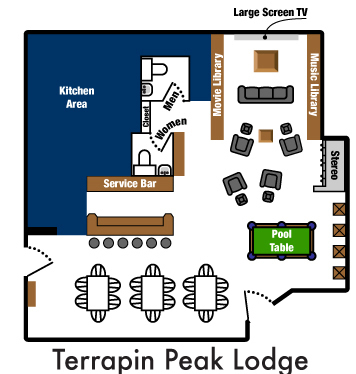 The common areas of the Terrapin Peak Lodge offers guests a variety of options including playing pool, watching TV or movies on the 120” screen with high definition and surround sound, listening to clean acoustic music or gathering with friends to play cards, board games or just relax. In the Main Dining area, guests can enjoy their Continental breakfast or request a hot breakfast or dinner prepared by Chef “What’s His Name”. Do check out our Breakfast menu or Dinner menu or detailed information about our dining here. 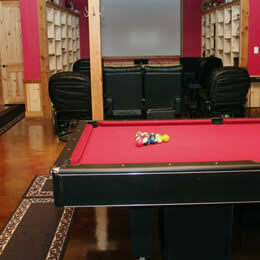 Dinner parties can be planned for six to twenty-six and can be utilized as a reception site for Oklahoma weddings. 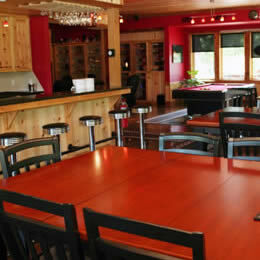 The Terrapin Peak Lodge is available for meeting space for $75 per hour, minimum 4 hours. Food and beverage is available for an extra charge.